The new Mattec system is connected to all of the 31 injection moulding machines on the shopfloor at AKI. 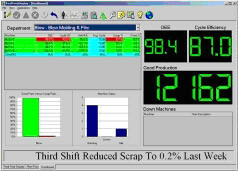 Mattec performs the production scheduling, collects data and sends it back to the WinMan ERP system, for instance showing how many good and bad mouldings have been produced. Currently the Mattec system counts machine cycles, picking up one signal to a data capture box: however eight parameters may be measured in future. For instance, the scrap figures for bad mouldings are being input manually at the present time yet will soon be measurable. Mattec sends its signal out every 15 minutes saying that, for example, a given machine “has made 100 components”. Then WinMan, via flexible backflush processing, draws down the material in Work-In-Progress (WIP) and works out how many kilos are left for precise weighing and returning to the Matban area. Under the previous system at AKI, weight is merely estimated. So Mattec data is fed into WinMan, telling WinMan that more raw material is needed from stock for the process. Process and production data for the value-added services provided in-house at AKI such as assembly, welding, polishing and pad printing can now be readily integrated into Mattec process monitoring along similar lines to AKI’s core activity of injection moulding.